The guy was scheduled to come yesterday "around 8 o'clock." The first thing to realize is that plumbers get their watches from the same place as cable guys, appliance repair guys, and teenage children. So I stay home from work to meet the plumber at the appointed hour (of 8:48). To their credit, they were upfront with their charge out rates. It's $120 to show up, then, $120 an hour. Now, when I'm paying that kind of coin, I think I should be able to just point to stuff and he, being a plumber should be able to deduce what the problem is. Kind of like plumber sign language. No time for small talk here. Get to work. Instead, I got the gabber. Nice guy, just liked to talk a bit. Now, if you know me, I'm a man of few (spoken) words. So when this gentleman started telling me all of my options in entirely too much detail, I stood patiently, estimating that our little 15 minute discussion was about $30. Hey, I'd love to talk about the problems with the Packer running game last week, but if I don't see some snaking going on here soon, I'm going to file for foreclosure. We had really four issues that he was visiting us for. 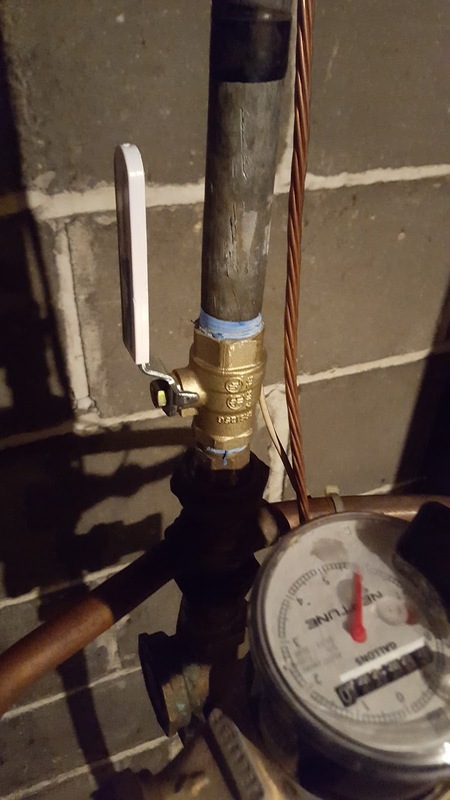 The first was the water main valve is corroded open and can't be turned off. Might seem like a minor issue, until we get that unexpected shower geyser or busted pipe and can't shut the water off at the main. Get out the surfboard and swim fins at that point. Catch a wave dude, cuz the surf's up! That job only took him about twenty minutes. Not bad, and it gave me incredible peace of mind. "That's the problem with these old houses..."
It turns out, that to remove the valve, because of the way it's threaded, he'd have to bash the cupboard floor out so he could unthread it. He admitted he didn't have time to do it that day and that if I could live with it I should. Hey, I can live with it if you can live with it. What are we standing around here talking about it? I should have been able to point at it, have him shake his head and we move on. Would've saved me ten bucks. The third and fourth issues were a slow bathroom sink and shower drain. While we were up there we got to talking about whether my shower was a "box drain" or some other style. 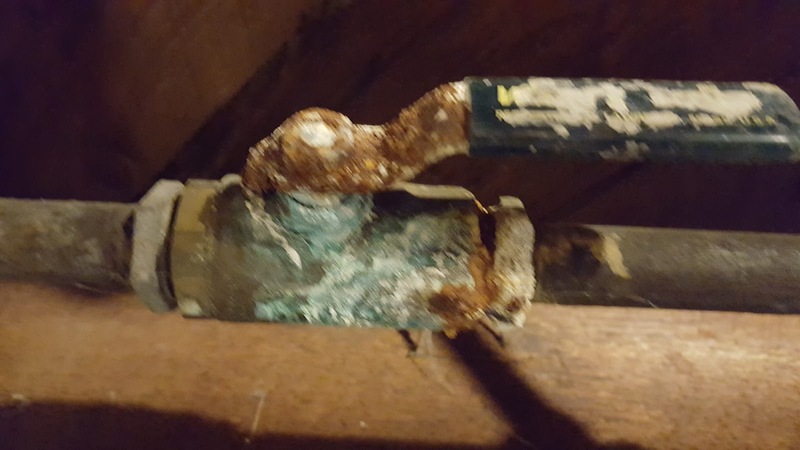 He was trying to speculate before he even opened it up, thus provoking another 10 minute "Plumbing 101" diatribe about the differences, pros and cons and "that one time he had one at this one house..."
What the outdoor shutoff's look like. Again, all I should need to do is point, make a snakey motion, and he should set to work. Save the small talk for email. Then, for some unknown reason, I mentioned that we'd like to renovate the entire bathroom someday, which sparked another rambling discussion about how to hack the cast iron tub out, or maybe get it reglazed, or maybe a Bathfitter solution. Hey, I don't know, so do you think Eddie Lacy needed better blocking, or was the play calling just bad? Bleeding dough at this point. Someone get me a tourniquet here. While we were in there, he mentioned the shower cartridge seemed sticky and would I like him to change it out as long as he was here? I changed it myself about 10 years ago, but you know what? He was here, it would save a trip to Home Depot and a whole lot of internalized, whispered cursing, so I said, "Hey, go for it. Make it nice for me." When all was said and done, after about two hours I was out $353.16 and I have no idea where the sixteen cents came from. I don't remember that anywhere along the way. Anyways, after all was said and done we are no further ahead with any significant plumbing improvements out of the deal at all. We ARE flowing again, which is a good thing, but hardly a selling point for the house. We're still mostly galvanized iron pipe. (I have PVC dreams at night, believe me.) We're still mostly unexposed, difficult to get at, old piping with crustified valves. We're still putting band aids on the bulging aorta. And I'm going to run with that.